My Favorite Sweet Potato Recipes<br/> Hint: They're Not Just for Fries Anymore! Hint: They're Not Just for Fries Anymore! Finally! 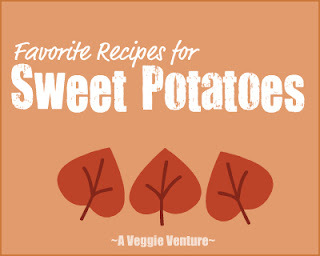 It's a veggie evangelist's dream come true, sweet potatoes named a food trend for 2011. In honor, I hereby present my best and favorite sweet potato recipes. Finally, there's a food trend for vegetable lovers. And it's a vegetable that's found in every grocery store in the world (I'm betting) not an obscure plant grown every third year on a certain hillside in the far reaches of Outer Mongolia reachable only to people who trek in on yaks. And it's affordable not the price of an orthodontist visit. And yahoo, get this -- it's healthy! And maybe famous! Will 2011 be remembered as the Year of the Sweet Potato? On Monday, Food News Journal (a great source of well-organized and timely food tidbits from both mainstream media and food blogs, best way to follow is via a free e-mail subscription) linked to Food Trend Predictions for 2011 from Tanya Steel at Epicurious. And right there, at #8, were "sweet potatoes". Yes, imagine sweet potatoes going all trendy! The New York Times thinks sweet potatoes are hot too, see Sweet Potatoes Step Out from Under the Marshmallows. That's the good news. The bad news is that much of the trend is headed toward sweet potato fries -- and you know what I think about sweet potato fries, see Frozen Sweet Potato Fries: Are They Worth the Price, the Calories?. So I've got a new campaign slogan, whaddaya think? Sweet Potatoes: They're Not Just for Fries Anymore. Here are my favorite sweet potato recipes, hold the fries, please. Laugh if you like, but all it takes to cook a sweet potato is to throw it into the microwave. It's perfect for a last-minute vegetable for a weeknight supper. It's perfect for a healthy inexpensive lunch at work. It's perfect for a mid-afternoon pick-me-up. Baking sweet potatoes whole -- well scrubbed, that's all the prep that's required -- is an especially good way to cook a lot of sweet potatoes at a time. It's easy-easy to put several sweet potatoes into a slow cooker in the morning, they'll be ready for dinner at the end of the day. Roasted sweet potatoes take on a dark sweetness that's captivating. Here's a summery version of sweet potatoes, great served warm or at room temperature. It's so easy to mash sweet potatoes, you don't even need a potato masher since they'll cook down so soft, they can be mashed with a fork. Simple plain Mashed Sweet Potatoes are lovely but do know, sweet potatoes play well with other vegetables, carrots and butternut squash are my favorite. Here's how to cook sweet potatoes in your slow cooker, imagine this for Thanksgiving! Everyone loves 'em! This is a another savory sweet potato dish, it was a real hit early this fall. Substitute sweet potatoes for potatoes in any stew but this stew, with chicken, apple cider and sweet potatoes (oh and a little bacon) really makes the sweet potatoes shine. Bacon and sweet potatoes, they're natural pals. But it takes just a little. Or if you like, follow the vegan path and use quinoa and coconut milk to add protein and creaminess. This recipe stuck with me for an entire year before the season rolled around and I could blog it. Sweet potato salads take people by surprise. There's all the familiar texture but entirely new taste ranges that are possible when you switch from potatoes to sweet potatoes. NEVER MISS A RECIPE! (OR A HANDY-DANDY VEGETABLE INSPIRATION GUIDE LIKE THIS) For 'home delivery' of new recipes from A Veggie Venture, sign up here. Once you do, new recipes will be delivered, automatically, straight to your e-mail In Box. Yum! Yum! Gorgeous recipes! A sweet potato casserole recipe my family enjoys is to layer (partially microwave cooked) sweet pototo slices with green apple slices- STAND UP slices- then sprinkle with brown sugar, dab with butter, a dusting of cinnamon and bake until hot. Great post! Gotta love sweet potatoes. Was thrilled when I first discovered that they did not always have to come from a can or be full of sugar and smothered in marshmallows. Another quick prep is to simply dice skinned sweet potatoes, put little olive oil in a skillet (I like cast iron for this) and saute. Season with salt, pepper and basil to taste. Yum. I have to try to mashed sweet potato recipe! I usually just mash frozen cubes up with white wine vinegar, salt, pepper, milk, and butter for a quick side dish. Your rustic recipe sounds absolutely delish! I LOVE sweet potatoes! They are part of the reason (brown rice is the other part) that I realized I could be a vegetarian and NOT feel deprived! Thanks for the recipes. On a busy night, we often zap a sweet potato in the microwave and eat it as is..no topping needed!